Migrate Outlook Settings – How to Migrate Microsoft Outlooks Settings? How to Migrate Outlook Settings? Microsoft Outlook is a popular email client that comes with Microsoft Office suite. It can be otherwise called as personal manager and communication program that gives unified place to manage e-mails, tasks, calendars, contacts, settings, RSS feeds etc. All the Outlook attributes are stored in Personal Storage Table popularly known as PST file. Outlook is used for both personal and business purpose. Most of the Outlook users who need to migrate from one computer to other computer or from older version of operating system to newer version of operating system often prefer to migrate the program's settings so that they can have the same interface on the new working computer or OS. For instance, if you wish to move on to the new workstation or need to install newer version of the Outlook, many of the settings will be lost. Even though it is not a major problem it can be frustrating experience having to re-create an Outlook bar with 100 folder shortcuts. It can be time consuming to re-establish all your account settings if you are switching to new computer. In such instances don't be despair.Make use of most trustworthy and award winning tool named Outlook migrate software which offers secure way to migrate settings. Why to use Outlook Migrate Software over Manual Recovery? Some of the tools are not Outlook specific. There are many chances that your mail profile gets corrupted during migrate process. So it is always recommended to work with damage and errors free Outlook migrate software other than depending on any other built in tools. Many users like to retain their Outlook settings when they move from Windows XP to Windows 7. In such cases make use of this software to migrate Outlook from Win XP to Win7. The advanced features of the software facilitates you to back up and recover various Outlook attributes like email folders, contacts, calendar items, journal entries, tasks, RSS feeds, rules, notes, E-mail accounts, junk e-mail lists and signatures which can be tiresome or tricky when done manually. The extraordinary feature of the application is built-in 'Scheduler'. It helps you to back up Outlook data automatically as per scheduled time or event. It creates four restore points to get back to previous Outlook state. You can also compress the backup archives using various back up techniques to save the disk space. If the destination drive does not contain enough space to allocate the backup archive then the software splits the archive so that the backup archives match the storage space available on the drive. You can also secure your backup archives with passwords. The outstanding features of the application have potential to back up contacts in Outlook 2010 with extreme simple steps. 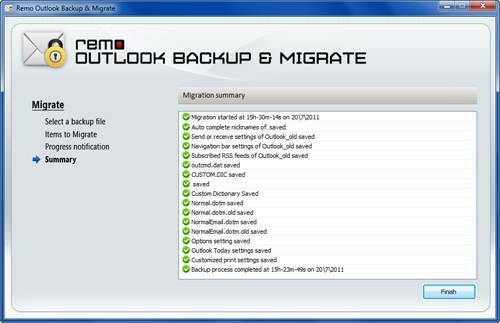 View the detailed steps with screen shots over here: http://www.migrateoutlook.com/backup-outlook-2010-contacts.html. This award winning application can recover Outlook data even when the Outlook profile is severely corrupted due to abrupt close of Outlook profile, virus attack, installation of faulty add-ins etc. This trust worthy software will never let you down as it is designed by good industry experts with excellent knowledge in programming. Step 1: Launch the application, by double clicking the desktop shortcut, or by selecting the icon from the Programs list in the Start Menu. The Main window pops up, as shown in Figure 1. Select the Migrate button, as shown in the figure. Step 2: Once you click on the migrate button, Migration window open up as shown in Figure 2. You need to select the backup file you want to migrate, by using the Browse button. Enter the password in the security check box (if you have secured your backup file earlier, with a password), and then click on the Next button to proceed to the next step. Step 3: On clicking the Next button, a new window to select the items to migrate, is displayed, as shown in Figure 3. Select settings, that you want to migrate, and click the Next button. Step 4: On clicking the Next button, the software proceeds with the migration process. After completion of the migration process, the Migration summary is displayed as shown in Figure 4.